COORG, a province of Southern India, near the centre of the Western Ghats, between 11° 56' and 12° 45' N. lat. and 75° 25' and 76° 13' E. long., is bounded by Mysore, Malabar, and South Kanara, and has an area of 2000 square miles. It is a mountainous district, presenting throughout a series of wooded hills and deep valleys ; the lowest elevations are 3000 feet above sea-level. The loftiest peak, Tandiandamol, has an altitude of 5781 feet ; another peak, is 5682 feet high. The principal river is the Cauvery, or Kaveri; which rises on the eastern side of the Western Ghats, and with its tributaries drains the greater part of Coorg. Besides these there are several large streams that take their rise in Coorg. In the rainy season, which lasts during the continuance of the southwest monsoon, or from June to the end of September, the rivers flow with violence and great rapidity. In July and August the rainfall is excessive, and the month of November is often showery. The yearly rainfall may exceed 160 inches ; in the dense jungle tract it reaches from 120 to 150 ; in the bamboo district from 60 to 100 inches. The climate, though humid, is on the whole healthy ; it is believed to have been rendered hotter and drier of late years by the clearing of forest land. Coorg has an average temperature of about 60° Palm, the extremes being 52' and 82'. The hottest season is in April and May. In the direction of Mysore the whole country is thickly wooded ; but to the westward the forests are more open. The flora of the jungle includes Michelle (Chumpak), Mena ([ron-wood), Diospyros (Ebony and other species), Cedrela [Poona (White cedar), Chichmssia tuinclari8 (Red cedar), Calophyllum angustOliton (Pours spar), Canarium stricture (Black Dammar tree), Artocarpus, Dipterocarpus, Garcinia, P,nouyntes, Cinnantommt leers, .Myristica, Vacciniuni, Myrtacece, Melastomacece, Rebus (three species), and a rose. In the undergrowth are found cardamum, areca, plantain, canes, wild pepper, tree and other ferns, and arums. In the forest of the less thickly-wooded bamboo country in the west of Coorg the trees most common are the Dalbergia latifolie (Black wood), Pterocarpus Marsupiunt (Kino tree), Terminalia coriacea (Mutti), Lagerstromie parviflora (Benteak), Conocarpus latifolies (Dindul), Bassia latifolia, 'Mee .frondose, ilrauclea parviflora, and several acacias, with which, in the eastern part of the district, teak and sandalwood occur. Among the fauna may be mentioned the elephant, tiger, tiger-cat, cheetah or hunting leopard, wild dog, elk, bison, wild boar, several species of deer, hares, monkeys, the buceros and various other birds, the cobra di capllo, and a few alligators. The most interesting antiquities of Coorg are the earth redoubts (kunniclegs), which are from 15 to 25 feet high, and provided with a ditch 10 feet deep by 8 or 10 feet wide. Their linear extent is reckoned at between 500 and GOO miles. The exports of Coorg are mainly rice, coffee, and cardamoms ; and the only important manufacture is a kind of coarse blanket. Fruits of many descriptions, especiaKy oranges, are produced in abundance, and are of excellent quality. The Coorgs, of whom the Kodagas are the chief tribe, constitute thirteen castes. They are of Dravidian origin, and retain the devil-worship of their ancestors ; they speak a dialect of Canarese. They are a well-formed, bold and active, but ignorant and superstitious race. The strange institution of polyandry prevalent among them, according to which the wives of the brothers of a family are common property, appears to have arisen from the necessity of counteracting the exterminating influence of wars by making the brothers of the slain the rightful husbands of their widows. The principal towns of Coorg are Merkara, time capital, Fraserpett, Somwarpett, Periapatam, and Verajenderpetta. In 1872 Coorg contained 510 villages, and its population numbered 168,312. Previous to its annexation to British India, Coorg was governed by a line of rajahs of the Nair caste of Hindus, mentioned in history as early as the year 1583. The ascendency of the last family of these rulers dates from the year 1632. Its princes retained their independence till the year 1773, when Hyder Ali, who had long sought the subjugation of the country, took advantage of a dispute about the succession to seize upon the sovereignty, and imprisoned the rajah. The latter subsequently effected his escape from captivity, and drove the armies of Tippoo Sultan out of Coorg; and in the war against Tippoo in the year 1791 lie proved a useful auxiliary to the British. On the defeat of Tippoo a treaty was entered into between the East India Company and Viraraja of Coorg, who dying in 1807, left the throne to his daughter Devammaji. Lingaraja, her uncle, who now usurped the throne, was succeeded in 1820 by his son, Viraraja. This monarch's misgovernment and oppression of Coorg brought upon him at length the armed inter-'creme of Lord William Bentinck ; in April 1834 lie was deposed by General Fraser, and his dominions were annexed to British territory. Since then the revenue has improved, cultivation has been extended, and the general prosperity of the country has steadily increased. Kodagu (Coorg) is the smallest district in Karnataka with wonderful and lovely natural sceneries. It is the birthplace of river Cauvery. Even though Kodagu (Coorg) is the smallest district it has it’s own virtues. It is surrounded by Kerala State in the west and south, to the north by South Canara district and Hassan district and in the east by Mysore district. It is from the word “Kudu” (which means “Hilly place”) the word Kodagu has come. But according to some other people it has come from the word “Kodamalenadu”, which means “Steepy hills and thick forests”. Abbi falls: This is a place situated at about 7 kms from Madikeri amidst natural beauty. This was formally christened as “Jessie falls” in honour of Chiplin’s first daughter, but later on called as “Abbi falls”. This is situated in the border of a cardamom garden surrounded by green hills and the waterfalls from 20-feet height, which has made the place a beautiful spot and attracts lot of tourists. During the days of Dharmaveera, the Ex. Governor of Karnataka, the steps to go to this place were built in cement. Auto fare: Rs. 40/- from Madikeri Town and private buses are available. Palace in the fort: At present the fort is situated at a top most point built with stones. Tippu after building a stone fort called this as “Jafrabad”. In the year 1790 Veerarajendra took back this fort to his custody. From then onwards it was in the hands of Haleri kings till 1834. Afterwards British captured it. There was a Veerabhadra temple to the south of the fort, which was later on occupied by the British, who converted it into a prayer hall. Lingaraja, who ruled Kodagu (Coorg) after Veerarajendra rebuilt a palace in between the year 1812-1814 with brick and mortar. During British rule, the palace was renovated twice. In 1933, a portico to park the commissioner’s car and a clock tower was also built. At present different offices of the district administration are lodged here. Omkareshwara temple: In 1820 a significant building built by Lingarajendra was Omkareshwara temple. This has both Islamic and Gothic style of architecture. There is a tank in front of the temple. There is a footpath leading to a small “Mantap”. The surrounding place is abode with peace. There is a story behind building of this temple. It is said Lingarajendra killed an honest and pious Brahmin to fulfill his political ambitions. That Brahmin became a “Brahmarakshasa” and started teasing the king with troubles. It left the king only when the king brought a “Shivalinga” from Kashi and installed it after building a temple. The shivalinga was named as “Omkareshwara” and regular rituals were performed. The bars of the windows of the temple were made of “Panchaloha” and an alphabet “lim” has been placed in between the bars. Four minars have been built on four corners of the temple and the central minar is like a globe, which anybody can see. The Graveyard (Samadhi) of kings: To the north of Mahadevpet in Madikeri city, there is a mount of mud having Samadhi of Kings. There we can see the samadhis of Doddaveerarajendra, his wife and Lingarajendra. His brother Lingarajendra completed the samadhi started by Doddaveerarajendra. Sannaveeraraja built Lingarajendra’s samadhi in the year 1820. In the year 1834, in addition to king’s samadhis, “samadhis” were built for diwans Teppadikeponnappa and “Rajguru” Rudrappa. We can see samadhis built for army chief Biddanda Bopu, who was the commander-in-chief for the army of Doddaveeraraja and Chikkaveeraraja and his son Somaiaha’s samadhi too. On the samadhi of Biddanda Bopu, there is a plate carved in Kannada praising him for his bravery shown in the wars fought against Tipu Sultan. All the samadhis of kings are in Islamic style and there is an alphabet “lim” in between two bars of windows. Raja seat: This is a place, where the kings used to spend their evening time enjoying the natural beauty. This is a place, from where you can see the far off green hills and the paddy fields, which are there in valleys. The tar roads look like serpents, which run between the thick forests. It is a very good place from where we can see the snows and clouds moving on the top of green hills. There is no other place from where we can see the wonderful sunset and enjoy the beauty of nature. The Government has many plans to make this place more beautiful. Bhagamandala: This is a pilgrimage center situated 39 kms to the west of Madikeri. To reach this place there are enough good roads from both Madikeri and Veerarajpet. Both private and government buses ply to carry the commuters. This is a place, where Kannika and Sujyothi, the two tributaries to Cauvery join. This is known as “Triveni Sangama”. Near to this sangama, there are four temples, where Eshwara, Subramanya, Vishnu and Ganapathi are installed. This is also known as “Bhagundeshwara Kshetra”. The pilgrims before going to Talakaveri take a dip in the sangama and perform “Karmas” (rituals) to their ancestors. (Known as “pindapradhana”). During the Cauvery festival and Tula Sankramana, tourists and pilgrims will assemble here in large numbers. There is a stone “Shasana” carved in Tamil language inside “Bhagundeshwara” temple. In between the year 1785-1790 it seems that Tipu had converted it into a fort and had a company of his army. He had named Bhagamandala as “Afesalabad”. In 1790 King Doddaveeraraja took Bhagamandala back after having a fierce battle for five days. During the time of this battle there was a damage caused breaking three copper plates by the “Firangis” directly handled by Doddaveeraraja, which were later on replaced by four silver plates. The style of the temples built in Malayali style brings the memory of temples in the far off Nepal. Private and government buses ply frequently. Talakaveri: After performing the “Karmas” to the ancestors taking a bath at Bhagamandala, one has to tread about 8 kms towards Brahmagiri hills, where one can land up at the birthplace of river Cauvery known as Talakaveri. This Brahmagiri is situated amidst green hills. There is a parapet wall of 30 by 3 feet to a tank. There is another tank adjacent to this, which is of a square 2 and ½ feet. It is in this tank that Cauvery takes her birth and flows. As per the local puranas, every year on a particular day and at a particular time the river Cauvery springs out and gives “Darshan” to her devotees. This is on 17th October every year. That day is known as “Tula Sankramana”. There are temples at Talakaveri of Agasthyeshwara and Lord Ganapathi. The Brahmagiri hill at the birthplace of Cauvery is about 300-feet height. It is believed that “Saptha Rishis” had gone for a penance here and got “Moksha”. In evidence of this we can see seven “agni kundas” even today. In earlier times, only young people could have climbed the Brahmagiri hills but now the Madikeri Lion’s Club have put about 435 stone steps and has made it easy for the pilgrims to go on top and have a view of the natural beauty. We can see Kudremukh, Chamundi Hills of Mysore and Vainad hills of Malbar and if there is a good clear weather, we can have a clear view of Nilagiri Hills and Arabian Sea from the peak of Brahmagiri. Chettalli: This is in the Madikeri-Siddapur road about 24 kms from Madikeri. There is a research center and there is a modern research center for agriculture also. They will grow fruits and vegetables in a scientific way. It is spread in an area of about 170 acres. There is a coffee research center also. Iggutappa devara betta: This is situated near Ayyangeri forest in “padithara valley”. There is a peak, which is a pilgrimage center and a holy place for both Kodavas and Hindus. The deity Subramanya is called as “Iggutappa” by the kodavas. The people of this district will perform special poojas frequently. Irpu: This is a very important holy place and pilgrimage center situated at 48 kms from Veerarajpet very near to the Kurchi village of South Canara on the banks of Lakshmanthirtha, where a Shiva temple had been constructed, the deity, it is believed was installed by Sriramachandra himself. On Mahashivarathri day people from all over the district will assemble here, after taking a dip in the river Lakshmanthirtha they will offer poojas to Lord Shiva. Around Irpu towards Vainad there is another peak Brahmagiri Shikara, which is known for its natural beauty. There is a guesthouse on the peak from where we can see the panoramic view of nature. The whole of Kodagu (Coorg) is a hilly area. Its physical features vary from place to place. From west to east it is steep. It’s about 1270 meters from sea level at Madikeri plateau near fort and 907 meters near Kushalanagar in the east. The average height can be taken as 1170 meters from Kodagu (Coorg) and it runs up to Somavarpet, which is 42 kms to the north of Kodagu (Coorg). Its physical feature is full of diversity. Near Somavarpet the small hills look like globe and it has valleys. Near Kodagu (Coorg) the hills are very close and have deep valleys. Near Kushalanagar the hills spread to a long distance and has plains also. Near Virajpet, which is considered as south Kodagu (Coorg), have long and wide paddy fields. In the east between Cauvery and Lakshmana thirtha rivers there are lot of paddy fields and has rich forest area too. To the west of this there is evergreen forest. Bamboos are the specialty of this forest. The Kodagu (Coorg) is full of beautiful forests and valleys. The whole Kodagu (Coorg) can be taken as a hill station. One can see the sky scraping hills. Wherever one goes one can see greenery. On the slopes coffee, oranges, pepper and cardamom are grown in abundance. The hills are covered with green grass and the valleys with evergreen forests. The whole Kodagu (Coorg) is full of natural panoramic sceneries. It is a homeland of natural beauty. It is rightly called as “Kashmir of South and Switzerland of India”. Weather: The district has a pleasant weather, neither it is too hot nor too cold. As it is situated on Western Ghats the rainfall is more. The average rainfall is about 2725.5-mm. The density of rainfall will go on decreasing as one moves from west to east. That is why the western part is cooler than the eastern part. Bhagamandal situated in Western Ghats has an average rainfall about 6032-mm and Kushalanagar situated in the eastern border has about 1120-mm. Generally the rainfall will be more in the months of June, July and August. 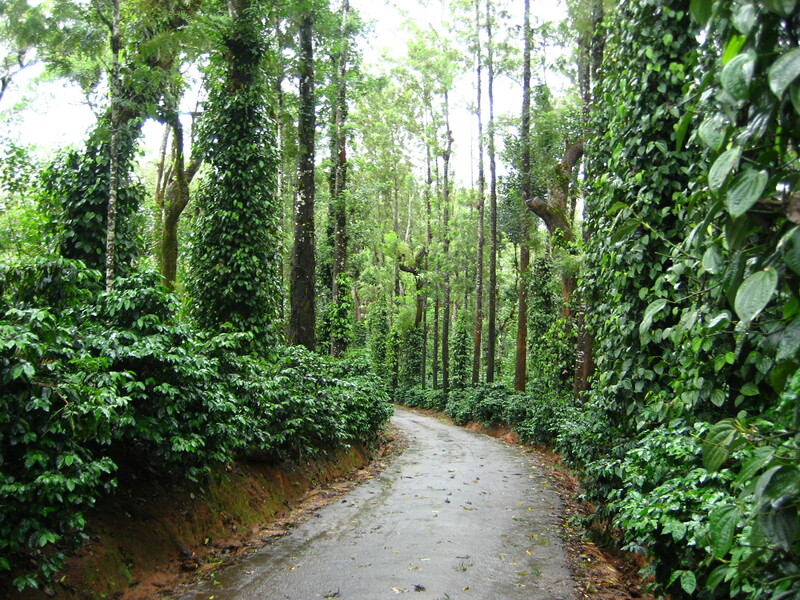 Forests: The area of Kodagu (Coorg) is 410775 hectares, out of which 134615 hectares are forests. It means about 33% of the land is covered by forests. The Government gets a lot of revenue out of the forests and also has taken a lot of steps to protect the forests. An Office of the Forest Department was started as early as in the year 1868. It is a very good place for tourists particularly those who are interested in Botany, Zoology, Agriculture, Horticulture and wild life. Many of the different types of trees of Kodagu (Coorg) are world famous. The teak grows naturally in the eastern part. Now a systematic plantation of the teak has been taken up, which brings lot of revenue to the Government. Historical Background: The history of Kodagu (Coorg) is full of diversities. Even though it was a very small in area it had its own administrative system not only at the time of merger but also for centuries. There is a mention of Kodagu (Coorg) as early as the second century itself in the Tamil literature. It has been said that the Pandyas Kingdom had been extended up to “Kudukam”. The Pandyas were the rulers of parts of Tamil Nadu, their capital being Madhurai. This Kudukam is nothing but Kodagu (Coorg). The name “Kudumalai” mentioned in Tamil “Shilappadikaram” is about this place only. The western border of Kodagu (Coorg) is just like the bend of a sword, the name Kudumalai is a more appropriate word to mention this place. Many kingdoms have ruled Kodagu (Coorg). It is known from the history that from 2nd century to 6th century the Kadambas ruled the northern part. While the Kadambas were ruling the northern part the “Kiggattunadu” and other southern parts were in the hands of Gangas from 4th century to 11th century. But they did not rule themselves directly but through their representatives “Changalva Arasus”. Changalvas had made “palsare” as their capital. In 11th century there was a war between Cholas and Gangas in which the Gangas were totally defeated and driven out. The Cholas became the sole rulers of the whole of Kodagu (Coorg). Even the Changalvas who fought along with Gangas against the Cholas also lost the war. From then onwards Changalvas became the subordinates of Cholas and ruled the southern parts under the Cholas. Kongalva’s Nayak Manija, who helped Cholas to defeat the Chengalvas, was given the northern part of Somavarpet and some parts of Arakalgud in Hassan district to rule and he was made a “Mandalika” of Cholas. During the times of Raja Raja Chola, there were lot of developments in Kodagu (Coorg). During 12th century the Hoysalas, who were in Belur of Hassan district drove away the Cholas from Kannada area i.e. Kodagu (Coorg) and they took full control of Kodagu (Coorg) But the Chengalvas didn’t accept the rule of Hoyasalas easily. But in the year 1174 AD Hoysala’s commander Bettarasa defeated Chengalvas’ Pemma Veerappa in the “Palser” war and made them their subordinates. During this Pemma Veerappa’s time, for the first time we can see the word “Kodagaru” carved on the stone shasanas. At the same time Kongalvars also accepted the rule of Hoysalas. During the 14th century the Muslims, who came from the north defeated the Hoysalas completely and ruined their kingdom. Afterwards Chengalvars made Srirangapattana, which is on the banks of Cauvery as capital and ruled. A little later on they made Periyapattana as their capital. Nanjaraja, who was one of the Chengalvars built a new town and named it as Nanjarajapattana from where he ruled. All these people were ruling under the Vijayanagara Kings. After the fall of Vijayanagara all the chief tans became independent and started ruling from wherever they stayed. The local Nayaks, the Palegars were ruling different parts of Kodagu (Coorg), as there was no co-operation between these different Palegars. Kodagu (Coorg) was never under any ruler. Later on the Haleri Kings defeated everybody and ruled Kodagu (Coorg) from 1600-1834. A Veerashaiva prince Veeraraja belonging to the Bidanoor kings clan came to Kodagu (Coorg) disguising himself as a “Saint” (Jangama) and started living in a place Haleri, 10 kms from Madikeri. All the Kodavas had no contact of the outside world. They were living in superstition and blind beliefs and with lack of wisdoms. The Jangama Veeraraja took control of that situation turning their weaknesses to his advantage and had a great influence on these people. His followers grown in numbers and he built an army of his own. He started defeating other Palegars and one day he announced that he is the “King of Kodagu (Coorg)”. As the small chief tans could not oppose him, they had no other alternative except accepting his rule. Thus for the first time the whole of Kodagu (Coorg) came under one man’s rule. A lady was also one among the Bidanoor kings, who ruled Kodagu (Coorg) (belong to this Haleri Veerashaiva clan) from 17th century AD. After Veeraraja, Appajiraja became powerful and ruled Kodagu (Coorg). Haleri clan kings made Haleri, which is near Madikeri as their capital. The third king of this clan Mudduraja was the first to build a fort, who ruled from 1633-1687. In the year 1681 he started leveling of hills to build a town and made that the capital. He built a fort around the town. The town was named as Muddurajakeri. As the time passed on the same Muddurajakeri became Madikeri. After Mudduraja Siribai Doddaveerappa ruled Kodagu (Coorg) for 49 years. He was a famous ruler, a courageous and honest one. He ruled Kodagu (Coorg) from 1687 to 1736. At the time of Chikkaveera, a weak ruler, Hyder Ali then the ruler of Mysore started encroaching Kodagu (Coorg). In the year 1763 Mysore grabbed some parts of Kodagu (Coorg). Even though Hyder Ali had a fierce fight against Kodagu (Coorg) he was defeated in the year 1766. Mudduraja and Muddaiaharaja came to power at Haleri and Horemale respectively after the death of Chikkaveerappa. Both of them died in the year 1770. During this time there was a difference among Haleri and Horemale rulers and one of them went to Hyder Ali for help. In the year 1773 Hyder Ali defeated the army of Kodagu (Coorg) and made Appaji, the son of Mudduraja as the King of Kodagu (Coorg). In 1776 Lingaraja became the king after the death of Appaji. Amarasulya and Bellora areas came under Hyder’s rule. At the time the death of Lingaraja his children were very young. So Hyder took possession of Kodagu (Coorg) and made Subbanarasaiaha as his representative. But there was uproar against him in 1782 and the prince of Kodagu (Coorg) was transferred to Hassan. At that time Hyder had died and his son Tippu had come to throne. During 1785 he put an end to this mutiny and deputed his army to different parts of Kodagu (Coorg). When there was uproar in the year 1789 Lingaraju son of Veeraraja escaped from the jail of Periyapattana and joined the corgis and became their leader. As there was insurgence in Malbar, Tipu could not take any action against corgis. At the same time Tipu had to fight with British also. Thus Kodagu (Coorg) could keep its independence. In the year 1809 after the death of Veeraraja, his daughter Devammaji became the ruler. But in the year 1811 Veeraraja’s brother Lingaraja took the reins. He built the palace and Omkareshwara temple at Madikeri. In 1820 Lingaraja passed away. Chikkaveeraraja, who ruled Kodagu (Coorg) between 1820-1834, was the last king of Haleri clan. When he came to throne he was only 22-years of age. He was the son of Lingaraja. As he had inherited lot of power, wealth through his ancestors and as he was very young he had a lack of knowledge and wisdom. So he was too much brutal and he terrorized the people. He even supported and encouraged the atrocities committed by the officials on the people and this paid a way for his destruction. A man by name Kuntabasava, who was taking care of his dogs, became his diwan. By this itself we can judge how he ruled his kingdom. The British, who were swallowing one state after another of Hindustan did not spared, leave Kodagu (Coorg) also. Veeraraja surrendered himself to Col. Fraser of the English army. Just pretending that they have taken the permission of the people of Kodagu (Coorg), the British captured Kodagu (Coorg) usurping power and brought it under their control in the year 1834, April 10. From that day Kodagu (Coorg) came under the direct rule of the English. Veeraraja was given a pension and was sent to Varanasi. In 1852 he went to England along with his daughter Gouramma and died there. Gouramma converted herself to Christianity and married an English army officer. When India became independent in 1947, Kodagu (Coorg) also got rid off the rule of English. In 1950 as per the new Constitution Kodagu (Coorg) became a state. In 1956 when there was a state reorganization Kodagu (Coorg) was merged with Karnataka and became a district in Karnataka. It has 3 taluks, Madikeri, Somavarapete and Veerajapete. Life style, Culture & Specialty: As per 1981 census Kodagu (Coorg) is small not only in area but also by its population. There are people of different castes like eravaru, kudiyaru, kurubas and tribals along with corgis (kodavas). It has large population of Harijans also. Kodavas are the people living in Kodagu (Coorg) having some special features of their own. It is said that Chandravarma of Kadambis was their ancestor. According to Father Heras, they are the people belonging to the Mohenjodaro civilization and one of their branches came south- world and stayed in this land of beauty. According to some others they are “Sythiyans” who came to India along with Alexander. They had a link with the Arabs who were regular visitors to India at that time and they started wearing dresses like Arabs. But there is no definite theory about the original place of Kodavas. Even though there is no historical proof there is no doubt that Kodavas belong to a very old civilization. They are having a life style and culture of their own, which is very special and attractive. Even their customs are also very special and attractive. Not only their dresses but also even the physical features of both male and female are very attractive. The “Janapada” (folk) songs rendered during marriages, birthday parties and at the time of deaths, during fairs are very philosophical and have a lot of meaning. Corgis are very much interested in martial arts. They are born soldiers. This community has given to great Generals to our nation, much more officers and many more jawans to the army. Huttariya kunitha, bolukata, ummathata, kolata, olagathata and kathiyata are some of the folk dances of the corgis. Festivals: Cauvery sankramana, shivaratri, huttari, kailapoladu, shashti and vishusankramana are some of the important festivals of Kodagu (Coorg). Kodavas have their own special way of dressing during festivals and marriages. The male members will have a jaripeta, black shirt and will have a silver sword in their waist. The female members will wear beautiful and attractive sarees and dress in their own special attractive way. Language: They have their own language known as “Kodava language”. It has no script of its own. It is a combination of Kannada, Tamil and Malayalam. But the words of Kannada are more. Appaneravanda Appachakavi and Nadikeriyanda Chinnappa are the two important poets and writers of Kodava language. Important Kodagu Festivals: Kodavas follow Hindu customs in this also. Indian festivals such as shivaratri, ugadi, sankramana and shashti will be performed. In addition, they have their own festivals like Kailapoladu, Cauvery sankramana and Huttari. All these three festivals will be performed in the whole of Kodagu (Coorg). The two Gods, which they pray more, are the Mother Cauvery and Iggutappadeva. Cauvery Sankramana: This will be performed on 17th of October of every year as on that day Cauvery river will take its birth at the appropriate and predetermined time and springs up three times. There is a belief that taking bath on that day at “Talakaveri” is as auspicious as of taking a bath in the river Ganges. This festival is the most important festival all over the Kodagu (Coorg). Many people even from different parts of our country will come on a pilgrimage to this place on that day. Kailapoladu: This means performing a pooja to the weapons, as the corgis are a martial race, they perform this on Mahanavami day during “Dasara”. Huttari: This is another important festival of Kodagu (Coorg). This will be performed on full moon day every year in the month of September or December generally. This is a festival of harvest. On that day the whole of Kodagu (Coorg) will be in a festive mood and people will enjoy, eating, drinking and dancing.